Remaining relevant in the fast-paced world of today is a challenge that all workers face. As economic development and technological changes hurtle on at an incredible speed, Singapore’s workforce must constantly upgrade to stay ahead of the curve. This makes both SSG and WSG crucial to the nation’s future, as together, the two statutory boards play a complementary role in empowering workers and businesses to become future ready. The SSG-WSG scholarship enables young talents who are passionate about creating a competitive workforce become well equipped. 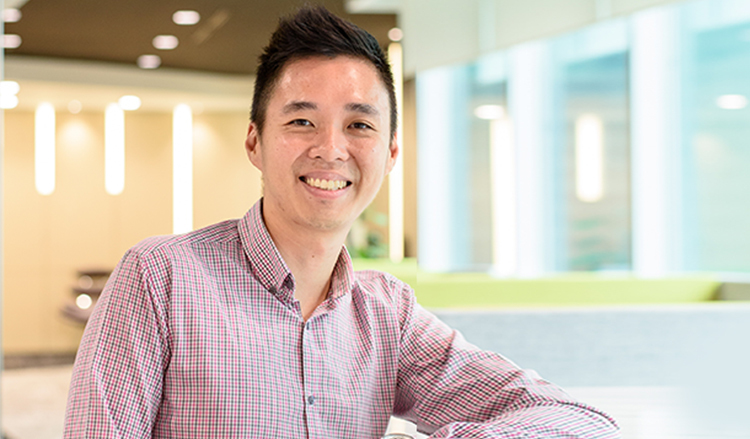 Scholar Desmond Yeow, 29, tell us what drew him to this scholarship, and how it has enabled him to play a part in shaping the nation’s skills and employability. What drew you to pursue a career with SSG and WSG? Desmond: My interest in WSG came during my two-year stint as a senior career guide at the NUS Career Centre. I was helping my peers improve their resume writing and interview skills, when I realised how important it is for workers to be willing to learn and take on challenges. While technical skills can be picked up quickly, it is one’s attitude which determines his or her long term success. I felt these characteristics were often overlooked by jobseekers and wanted to do my part in promoting lifelong learning and skills upgrading for our local workforce. How has the scholarship benefitted you? Desmond: The SSG-WSG scholarship offers many avenues for individuals to stretch their limits and develop new strengths. For instance, in my current role as an industry engagement officer, I oversee the Aerospace and Wholesale Trade sectors and work with companies to implement progressive HR practices to increase productivity. My job is challenging as we work with a wide variety of firms, all of which face different manpower issues and require us to come up with different approaches. Share about the impact you have seen SSG and WSG have on the workforce. Desmond: We are involved in developing the Jobs and Skills pillars of all sectoral Industry Transformation Maps (ITM). This includes deepening partnerships between Government, companies, trade associations and chambers to tackle specific issues within each sector. In addition, WSG champions a variety of programmes to ensure that Singaporeans remain employable. For example, under the Wholesale Trade ITM, WSG has launched the Professional Conversion Programme (PCP) to help people find meaningful careers in the Wholesale Trade sector. The programme helps PMETs without the requisite experience rejoin the workforce and upgrade their skills to stay relevant. To date, more than 80 PMETs have been placed in companies such as Cycle and Carriage and Mastercard. What can aspiring scholars look forward to? Desmond: If variety is your cup of tea, the SSG-WSG scholarship also allows you to choose among 40 different divisions across both agencies, ranging from Strategic & Resource Planning, to Career Services and Skills Development divisions. The plethora of choices really sets the SSG-WSG scholarship apart from others!